What is going on in this photo you ask? It is an image of one of our buildings and shows the edge of the building wall (left) with the depression in the centre left by the fireplace and, on either side, parallel rows of stakeholes. The floor of the building can be seen at the top of the picture. 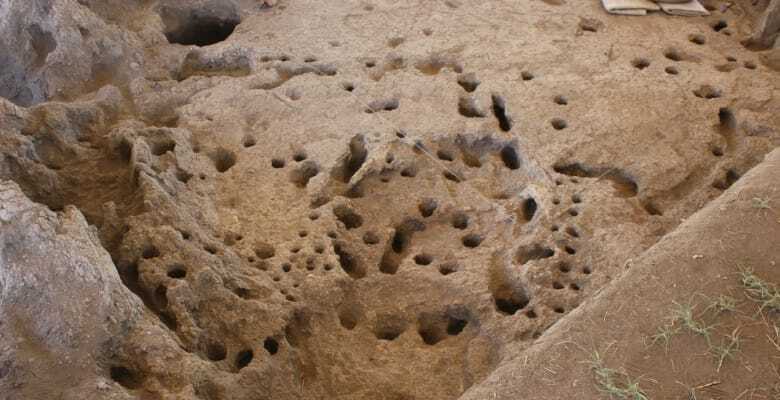 The other holes are a mix of animal burrows and holes for stakes/posts. We think the parallel lines of stakeholes may have held some kind of room division or frames for drying or cooking food around the fire. These features are hard to see and take careful excavation but the information allows us to understand the conditions of ancient life in great detail.